The most popular and ubiquitous blogging script is WordPress, no doubt, because it is easy and it makes you do what you want to do i.e. blogging, while it oversees the technical aspect of your blog. While writing blog posts, we often include images for visual illustration purposes. WordPress resizes the images in small, medium, large dimensions for you to insert the image in the desired size while maintaining aspect ratio. This is really a cool feature of wordpress which doesn’t rely on width and height attribute of image tag, thereby making your webpages load faster. But things are changing fast and the world is heading towards higher resolution smartphones, tablets, computers and TVs. So, if we insert images in default medium dimension set by WordPress, the images appear too small. If we insert the full size image but with custom width and height attribute to make it appear reasonably sized, it is not considered good practice. So, what should we do? Well, we can change the default dimension of the medium size considered by WordPress according to our theme design. here is how to do it. Log into to wordpress admin panel. Go to Settings > Media. Now change the default set dimension there as you desire. For example – For this blog – Techotv.com, I’ve set Max Width of 500 and Max height of 400 for medium size. 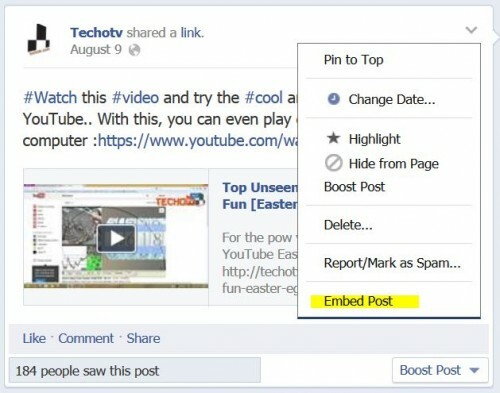 If you post any youtube link directly into new post visual editor, the post shows the corresponding YouTube video when the post is viewed by automatically adding the necessary embed codes but sometimes, the video is stretched to cover the sidebar overflowing the main content area. If this type of problem happens on your website. It is probably because of your wp theme. Anyways, you can correct such problem by putting reasonable value in Maximum Embed Size (I’ve put width and height value to 500) here under media settings. After making the desired changes, hit on Save Changes button. Now, when you write new posts, the images will have the dimension you specified here in the medium size. But what about previously written posts, are images of those posts also resized according to the newly set dimensions? The answer is no. Those are not resized. This is effective only for new posts. To resize all your previous posts’ images to the new size, you’ve to use wordpress plugin. There are many such plugins available to do this job, one such is Regenerate thumbnails. Search for this plugin in wordpress plugin installer from admin interface and install it. Now the question arises, Should I use such a plugin to resize old images? Well, it is personal preference but remember not to delete the old dimension based images because that may mess up with your already indexed images in search engine. We’d also advise you to check the most common screen resolution that most of your visitors have before making the above mentioned changes as that will give you a fair idea as what should be best value value for resizing. In this concern, we’ve published easy guide to check your visitors screen resolution in Google analytics . Have any question related to blogging or WordPress? We’d love to help you!